To a Buddhist, a thing, whether simple or beyond reason, is nothing but the outcome of the right mix, i.e. right temperature, right pressure, right time, etc. To a free spirit, that extraordinary thing is synchronicity, namely synchronized factors or causes of which the event is the result. To everybody else, an extraordinary event or happening is a miracle, pure and simple. The original San Pascual Baylon icon, missing since June 2010. Speaking of which we have San Pascual Baylon–a prodigy at creating miracles. Pascual was a born mystic, and even as a young shepherd, he was a master of contemplation. He was thus able to achieve unbelievable feats, the most famous of which was his causing water to gush out of of a barren rock formation–he was able to concentrate to create the miracle out of his love for his fellow shepherd, who was very thirsty then. After a month-long voyage by sea, the image of SAN PASCUAL BAYLON arrived in Tacloban City. The barrio founders met the image at Dagami after which a procession followed, bringing it to Guinarona. The sun on the left, mimicking San Pascual Baylon’s reliquary (right) on May 13, 2013. Flash forward to May 13, 2013. 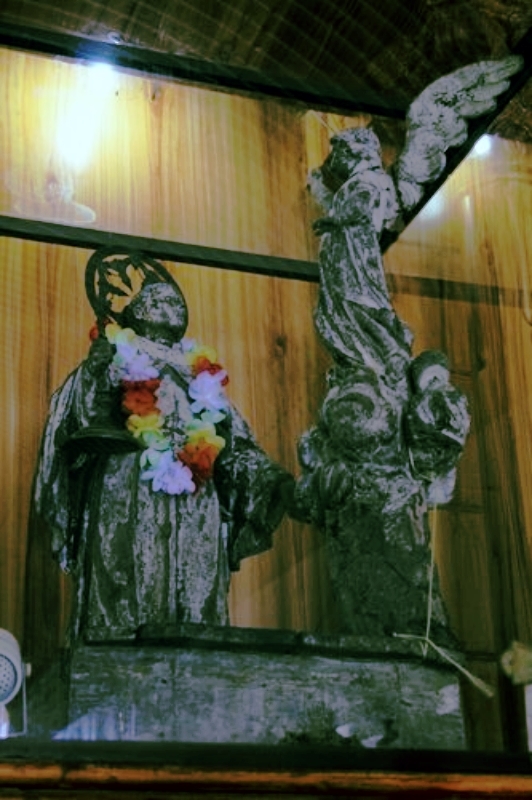 The San Pascual relic was still in Manila and was being prepared for its travel to Guinarona. On this date, the sun appeared to mimic San Pascual’s reliquary as the above picture shows. Right after the installation, another text message from Lani came, expressing his thanks and that he was just summoned by his boss (his superior when he was fired by the Department of Justice) to report for work–in his boss’s office, NO LESS, and that all the charges against him have been dropped. Just like that–VERY FAST. Now, now, is this a miracle by San Pascual’s relic?